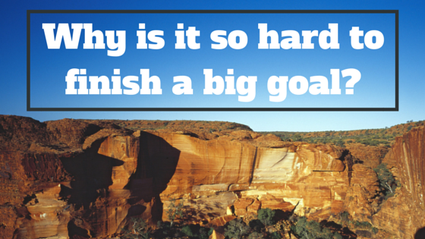 Why is it so hard to finish a big goal? As you take a large breath of that hot, humid air outside, it’s hard not to reflect on all of the projects people begin as they look forward to their summers. So many of us start diets, begin that off-season training, prepare for a college or graduate school exam, and use the summer as our playing ground. We have a few months of relaxed attitudes and long days, all gearing up for that day on the beach to show off our new figure, make the varsity squad in preseason, or land that great score that’s sure to lead to admission. But now we’re in the dog days of summer - the days are hot, they’re humid, and people are getting tired. Those big dreams from the beginning of the summer become just that, dreams. Why is that? How can just a few weeks of fatigue and some high temperatures cause us to just give up? Well, it’s because big goals can be pretty daunting. And truthfully, there’s a lot more to goals than just a clever acronym (here’s looking at you, S.M.A.R.T. goals). You see, we put a lot of energy into thinking about what we want and forming that perfect finish line. That mental image motivates us to get through a few weeks of work; it wakes us up early, reminds us to hit the gym or the books – but the feeling doesn’t last. After a few weeks, you find yourself hitting the snooze button, both in reality and on your goal. Sound familiar? We’ll share a trade secret with you - goal setting, as a concept, is a huge misnomer. It puts so much emphasis on the image of the finish line. It’s almost as if, once you can see it in your mind, that’s it, voila! The goal is set and you are done. I don’t mean to downplay the importance of the finish line because it is crucial, but it’s only the first step. Just like on a GPS, to get accurate directions you need to put in both the destination and the starting point. A lot of people forget to outline where they are starting from, including their weaknesses in relation to their goal or the obstacles already in their way. When you’re honest with yourself at the beginning of the process, it makes the long, yellow brick road look much more manageable. Big goals are just like big meals, more enjoyed in small bites. Therefore, do yourself a favor and start with checkpoint goals, smaller goals that can be accomplished in a fraction of the whole timeline. When determining your checkpoints, make them realistic but challenging and be sure that you’re arming yourself with the knowledge, skills, and attributes needed to make it to the end. Here’s something else to consider: other people can help you get there. In the popular media, it would seem like the jury is still out on this. But I can assure you, telling others about your goal can have a large impact on whether or not you reach it. Certainly there’s the guilt factor of telling others what you want to achieve and then falling short, but more so, you can use your social circle strategically. Choose three friends to share your goal with and match them to the following characteristics. First, ask a friend to be your cheerleader; their job is to only pat you on the back as you get closer and closer to your goal. Second, ask someone to be your scorekeeper, or a neutral party that simply checks off whether you did or didn’t reach certain checkpoints. Third, ask a friend to be your critic; their job is to challenge you, to push you farther than you think you can go. Here’s the deal though – it’s important that different people play these roles, not one person acting as all three. Also, you can’t have a role – you’re already working hard enough! In the end, if your goal is really important to you, make it a priority to go after it with all of your heart, mind, and body. Don’t let a few weeks of summer get in your way. If you have questions about goal setting or you’re in the market for a critic, let us know. Stay tuned for more performance psychology topics and commentary on our blog coming up soon! John Keenan is a running and mental skills coach located in Atlanta, GA. He specializes in mentally preparing athletes to perform at their best when it matters most. To work with John on your goals and mental game, visit intrepidperformance.com/contact.